The Sinclair Dinosaur Exhibit has been built by the Sinclair Refining Company at the 1933 Chicago World's Fair and is the first attempt to recreate out-of-doors a portion of the earth's surface as it existed 100 million years ago. 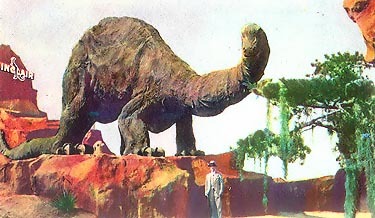 The huge beast shown here is a Brontosaurus. He bulked 40 tons in life & was 70 feet long. The Sinclair exhibit at the 1934 Chicago World's Fair alone had 16 million visitors, featuring seven life sized dinosaurs, two of which were in a mock battle complete with sound effects. Sinclair Oil was looking for a new and different symbol that brought instant recognition and identity. The dinosaurs made sense as the fossil fuel had been in the ground since the time of the same dinosaurs. Advertisements began to picture cave men fishing from the backs of Dino with the caption, "If you lived 100 million years ago". Or that the Sinclair Oplaline Motor Oil brand had been "Mellowed 80 million years". Could you imagine a bottle of Highland Park at 80 Million.......OK I'm sidetracked. There was one significant and unexpected windfall. One of the dinosaurs generated a remarkable popular appeal. In fact he was a real glamour boy. A peace loving (he must have been from a Sinclair Sept) but massive brontosaurus he weighed in at 40 tons and was 30 feet in length. Sinclair supplied schools and libraries with study materials. They also sponsored Dr. Barnum Brown's research expeditions for the American Museum of Natural History and the Peabody Museum. The public equated Dino with power, endurance and stamina, the prime qualities of Sinclair products. Children only knew the loved Dino. Dino is still the symbol of Sinclair Oil, the longest running American trademark whose color and shape, have not changed. Happy 71st. birthday Dino.